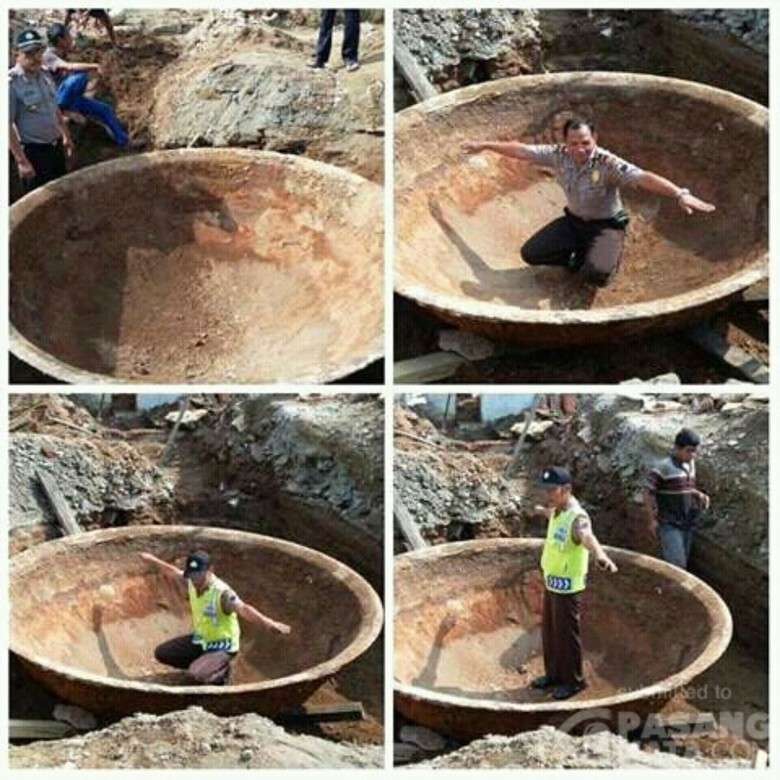 A Giant frying pan has been discovered in the district of Kutoarjo in Central Java. The shocking incident occurred on Jl. MT Haryono, Kutoarjo, Purworejo. Local residents were preparing to expand a complex of shop-houses, when they stumbled upon a strange object that resembles a giant frying pan. 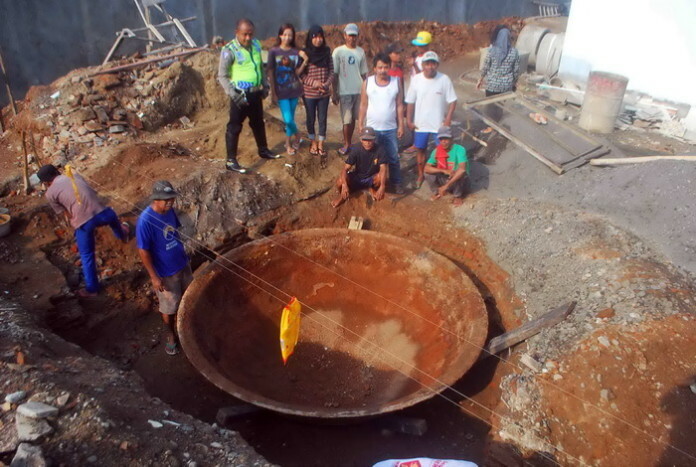 Construction workers puzzle over the strange discovery of a giant frying pan. Source. The odd discovery attracted the attention of many curious passer-bys on the day of the incident. The news spread quickly by word of mouth and Social Media, bringing many excited local residents to the scene. 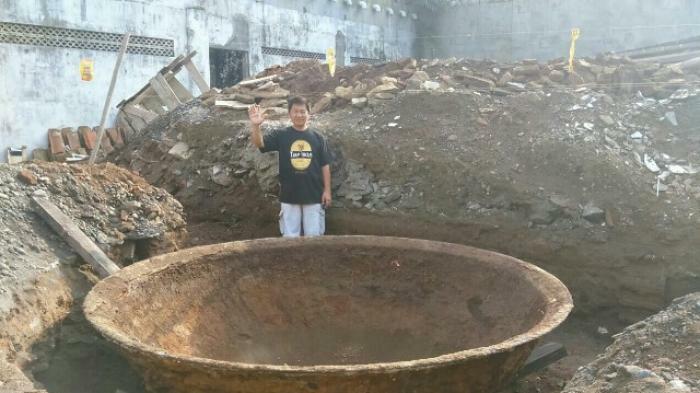 The giant frying pan was found in the soil at a depth of about 90cm while workers were digging to build the foundation for the upcoming complex. “We were digging to make the foundation, when suddenly, we struck something solid,” says Haryanto, one of the construction workers. “Originally, we thought it was a pipe!” After continuing the digging, the surprised workers found that it was a giant wok, and that the ancient artifact was still intact. Mr. Widodo, the owner of the land, was evidently intrigued to find such a mysterious item buried on his property. The land had previously been vacant for several years before it was purchased by Widodo. 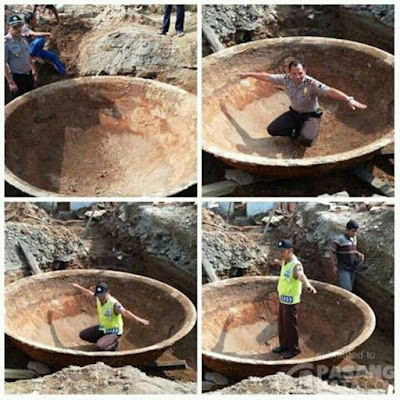 2.7 Meter "giant frying pan" discovered. Source. “I don’t know why it’s so big,” added Sugeng, who lives close by to the scene. “I’ve never heard any old stories about this area, so I’m really not sure what it might be,” he concluded. In addition, the construction workers have also uncovered a used oil furnace, which was likely once used beneath the giant pan. Locals suggest that the pan is an ancient relic which was used hundreds of years ago. Police have investigated the scene, but as of yet, the origin of the giant frying pan is yet to be determined. The giant pan is made of iron and measures approximately 270 cm in diameter. Some parts of the pan are rusting. A passerby poses with the giant pan. Source. Today (30/4/2016), everything is back to normal and the road is quiet again. The location is not secured, as it is within a shop house complex. People are therefore free to enter and exit as they please. So as to not damage the giant frying pan, or any other potential findings, the construction of the shop-houses has been temporarily suspended. * That is amazing ! Wonder if anyone has found any giant bones or skeletons in that country in the past ? There are "hobbits" in Indonesia. Homo floresiensis, an extinct species of tiny humans that stood roughly 3.5 feet tall. RT just did a short video-story on the continuing excavation of the largest stone sphere on the planet. "This may be the largest and oldest sphere carved by human hands in Europe. Its origins are still a mystery, although it is believed to have been around for 1,500 years. The stone sphere has a diametre of around 10 feet and an estimated weight of 70,000 pounds. Hundreds of tourists from around the world have already descended onto the forest near the town of Zavidovici, in Bosnia and Herzegovina, to see the sphere." I have read your website before! I read your article about the Yonaguni Monument. Will definitely follow the progress of the Bosnian Pyramids. Interesting. That looks about right. A curious object nonetheless, although not necessarily from "giants." Similar but smaller than the Bronze Sea in front of the Jewish temple, Jerusalem. Any bronze oxen around?